When a staircase arrives from Pear Stairs, the winder on a staircase has been disassembled. The straight legs of our staircase remain assembled. This will allow you to manoeuvre the staircase through the front door to its correct position. If you have ordered MDF treads for the winder box then you must NOT use standard wood screws. 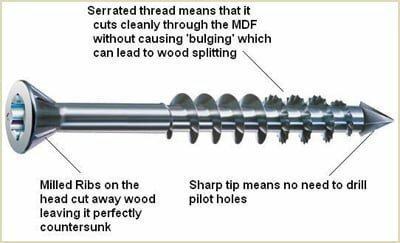 Using normal screws designed for Hard or Softwood can cause the MDF to bulge and eventually split. For MDF treads and risers, a slightly different approach is needed. 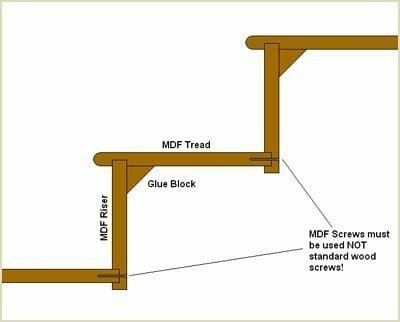 No pre-drilled holes are needed for MDF, as it is recommended to use special MDF screws. These have the added benefit of not splitting the MDF board, as can occur when drilling pilot holes or using unsuitable screws. Remember if you have questions don't hesitate to phone us about your staircase finish.